Katie is a Maryland and Nationally certified Speech-Language Pathologist who has been practicing since 2015. She received her Bachelors and Masters degree in speech-language pathology at Grand Valley State University in Allendale, Michigan. She has experience treating children and adults with various difficulties in cognition, language, articulation, fluency, and swallowing in the Texas school system, skilled nursing facilities, and outpatient pediatric facilities. Katie is certified in CPR. 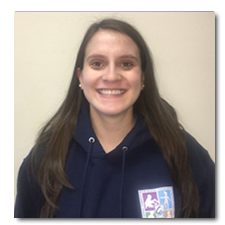 Katie enjoys working with children with complex language and articulation challenges. She integrates and consults with Occupational and Physical Therapists regularly to assist in incorporating a whole-child approach.